The theme here seems to be that PVC works for fishing rods. Fishing rods are long, and PVC comes in long tubes. Likewise, ceiling mount. 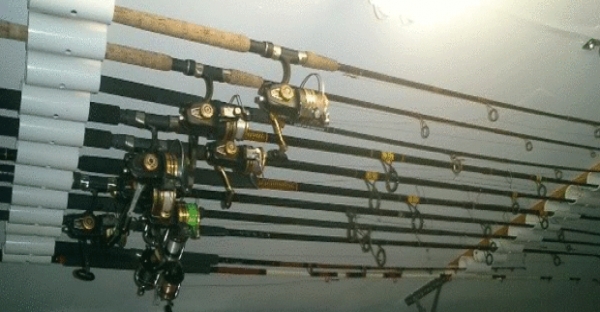 Long fishing rods need a place to rest out of the way. Walls usually are cluttered already, so why not hang them on the ceiling. The ceiling is also a good spot for rods because nothing will fall on them up there — all you have to do is be careful you don’t let them fall yourself. Here’s a simple one. You can make this at home. It’s also very inexpensive. It could take a while to build though relative to the other options. This is a great option if you just have a few rods to store. It is quick and easy to build and you don’t have to spend a lot of time giving each rod an individual home. I shared these ideas with a fisherman I know, and he seemed to think this was a pretty good idea. So if it passes that test (this guy makes a lot of things to do with fishing himself), it might just be a good installment.